On the 1st (Thu), ponder the world of politics at National Palace (Palacio Nacional), explore the world behind art at Palacio de Bellas Artes, then contemplate the long history of Chapultepec Castle, and finally examine the collection at National Museum of Anthropology (Museo Nacional de Antropologia). Keep things going the next day: take an in-depth tour of Templo Mayor Museum, then delve into the distant past at Metropolitan Cathedral (Catedral Metropolitana), then don't miss a visit to Zocalo, and finally see the interesting displays at Frida Kahlo Museum. To find reviews, where to stay, traveler tips, and other tourist information, read our Mexico City vacation builder. Ottawa, Canada to Mexico City is an approximately 14-hour flight. The time zone difference when traveling from Ottawa to Mexico City is minus 1 hour. 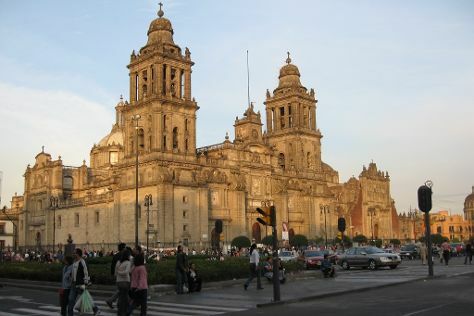 Traveling from Ottawa in February, things will get warmer in Mexico City: highs are around 27°C and lows about 9°C. Finish your sightseeing early on the 3rd (Sat) so you can travel to Tulum. Get ready for a full day of sightseeing on the 4th (Sun): make a splash at Xel-Ha. For ratings, maps, and more tourist information, read Tulum tour planner. You can do a combination of flight and shuttle from Mexico City to Tulum in 7 hours. Alternatively, you can take a bus; or drive. The time zone changes from Central Standard Time (CST) to Eastern Standard Time (EST), which is usually a 1 hour difference. Traveling from Mexico City in March, you can expect nighttime temperatures to be somewhat warmer in Tulum, with lows of 21°C. Finish your sightseeing early on the 5th (Mon) so you can drive to Cancun. Start off your visit on the 6th (Tue): get close to the beloved marine mammals with a swim-with-the-dolphins experience. To find photos, other places to visit, traveler tips, and tourist information, use the Cancun itinerary maker. Traveling by car from Tulum to Cancun takes 2 hours. Alternatively, you can take a bus; or take a shuttle. In March, daytime highs in Cancun are 32°C, while nighttime lows are 24°C. Wrap up your sightseeing on the 6th (Tue) early enough to travel back home.